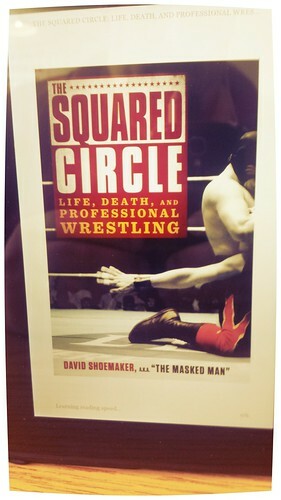 I just finished The Squared Circle: Life, Death, and Professional Wrestling by David Shoemaker. It is an impressive book and worth buying. I would tell any wrestling fan it is worth reading. I am not talking about just current wrestling fans, anyone who has ever been a wrestling fan will enjoy it. Even if you have not watched a match since Wrestlmania V or the last Monday Night Nitro, part of this book will speak to you. But despite the attention from the highbrow magazines, the sports journalism establishment hardly cared. Perhaps they realized that pro wrestling made them expendable: The wrestling matches mythologized the athletes and wrote the stories themselves. The book is an enjoyable read. I had an easy time getting into it. I read it on my kindle, mostly on my lunch break. The chapters are the right length where I could finish a chapter or start over if I needed to get back to work. Each chapter is the story of a different wrestler. The roots of the book was Shoemakers Dead Wrestler of the Week column he started at Deadspin. He tells the story of pro-wrestling by framing the stories around the dead wrestlers. He does not focus on how wrestlers died, but how they lived. He frames many of the great stories of wrestling this way. History of professional wrestling told through the stories of people who made the myths and who thereafter died. It’s the story of a mythology populated not by gods but by real men, fallible mortals who served as vessels for a larger truth, men who lived the lives of kings and who suffered to be our idols. He starts the book with the History of Wrestling. He tries to figure out the point where wrestling went from a competitive sport to a "worked" sport that we have today. This gives him a way to introduce many of the tropes of wrestling. This was the least interesting part of the book to me, but I can see why he had to include it. You could tell he did research on this part of the book, but only about 10% of it was new to me. Two separate questions: (1) When did wrestlers start fixing matches for entertainment’s sake? And (2) When did fans realize that the sport was counterfeit? Both answers are more than a little ambiguous, but here goes: (1) From the very beginning, and (2) it doesn’t matter. The most interesting stories were about the wrestlers I watched first hand. Reading about Andre the Giant, Randy Savage, and Road Warrior Hawk put a smile on my face. It made me feel like I was celebrating their lives. It is odd to read about them now because I am older then they were when I started watching them wrestle. Andre brought on Heenan as his new manager—the ultimate signal of his turn to the dark side—and in a moment of shocking realism, he tore off Hogan’s shirt and ripped the gold crucifix from around his neck, incidentally scratching Hogan’s chest and drawing blood. Clearly, Andre was neither subject to the “demandments” of Hulkamania nor the mores of common Christianity. After all, what does one god have to offer another? It is the stories like Curt Hennig that make me sad. While we saw a lot of great matches from Mr. Perfect, I always felt like he never got as far as he should. The sad stories are the people you feel did not get enough out of their life. More of these stories are in the back of the book, for the wrestlers about my age. Little wonder, then, that those young boys grew up to be the generation of assholes. Mr. Perfect epitomized everything we wanted to be years before we could put it into words. (The prominent bulge in the front of his tights probably didn’t hurt matters.) He was the harbinger for a generation of jackassery, of smart-guy sarcasm and holier-than-thou snark—of Internet machismo, Tucker Max, Bill Simmons, and Deadspin .com. We are the Mr. Perfect generation. I could tell that David Shoemaker is younger than me. The book did not have the feeling of a writer that have lived first hand through things before I was a wrestling fan. This books is good, but it left me wanting more. There are more dead wrestlers who I want to read about, more periods of wrestling to explore, more wrestling promotions to learn about, and more wrestlers to read about. May of the people in this book deserve their own book. I have no doubt that Randy Savage or the Von Erich's could support a whole book. ultra of reality in wrestling. The enlightened wrestling fan has likely spent significant amounts of time explaining to nonviewers that even though wrestling is staged, it’s not fake—that no amount of planning, no amount of scripting, no amount of physical trickery or assisted landing, no amount of ring elasticity or floor mat cushion can remotely assuage the physical assault of an average wrestling match. The book ends with the duel stories of Chris Benoit and Eddie Guerrero. Their deaths was either the last moment of the last era in wrestling or the first moment of this era of wrestling, maybe there is no difference between the two. There is a darkness that hangs over everything we see when we watch wrestling. Reading this book just makes that clear. Chris Benoit was a world champion, and he murdered his wife and son and killed himself. The latter act doesn’t actually erase the former, but it suffocates it.